Key Difference: A Project Manager and a Product Manager are very similar. Both are responsible for something from start to finish. The main difference is that a project manager is completely responsible for the start to finish of a project, while a product manager is completely responsible for the start to finish of a product. Project Manager and Product Manager are common titles that a person may some across in the corporate world. However, what do they exactly mean and how do they differ from each other? A Project Manager and a Product Manager are very similar. Both are responsible for something from start to finish. This includes the planning, investigating, selecting, executing, finishing, and profitability of the said something. The main difference is that a project manager is completely responsible for the start to finish of a project, while a product manager is completely responsible for the start to finish of a product. Product includes any tangible or intangible item or service, or bundles of goods and services offered for sale. Now, depending on the company, a product may be treated as a project, while a project may be the development of a new product. This distinction is especially blurry in industries such as technology where the terms product and project are often used synonymously. However, the main distinction resides in traditional industries. In traditional responsibilities, the product manager will generally be responsible for developing a new good, service or product that is usually tangible, but not necessarily so. A product manager will have to develop the product, source its resources, and lead it into manufacturing, all the while ensuring that the product will be marketable. In traditional responsibilities, the project manager will generally be responsible for the feasibility of the project. They have to make project goals, ensure that the project goals are being met, and see to it that the project is developing properly and on schedule. The project managers also usually deal directly with the clients, and hence are responsible for predicting client needs and meeting them in regard to the project. Additionally, one the project is over, the project manager will move on to the next product, whereas when the development of the product is done, the product manager will generally be responsible for the production of the product and to ensure that the product continues to be successful and more importantly profitable. 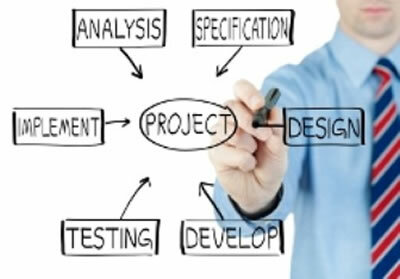 A project manager is a professional in the field of project management. 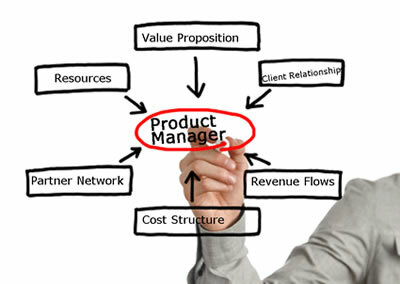 A product manager is a professional in the field of product management. Investigating, selecting, and driving the development of products for an organization. Must make the product profitable. Creating clear and attainable project objectives, building the project requirements, and managing the constraints of the project management triangle, which are cost, time, scope, and quality. Is also a client representative and has to determine and implement the exact needs of the client. Construction industry, architecture, aerospace and defense, computer networking, telecommunications, software development, as well as production, design, and service industries. Common production industries, fashion, banking, insurance, music, information, technology, and services.